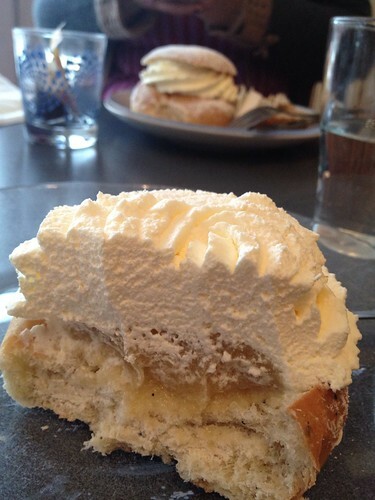 It's not shrove Tuesday just yet - the day when Swedes traditionally eat semla. (February 21, this year) Me, I like semlor quite a bit, so I don't mind eating them early. I snapped this shot to show you how a semla is built. It's basically a very fluffy yeasted bun, baked with lots of cardamom. You hollow out some of the bun, and mix it with almond paste, and maybe a spoonful of milk to make it softer. (And then you put that filling back in the bun.) Top with lots of lightly sweetened whipped cream. And a little tiny lid, with powdered sugar - I've already eaten mine, you can see one in the background though. People often ask me for a recipe. Sorry, I don't have one. I've never made them. For good reason - I don't want to make and eat a whole batch! I like eating just one, so I stick with the good bakeries. However, Dagmar can make some great semlor, and she has posted a recipe in English.